Must See Great Shark Movie. It’s a science fiction horror film. Set in an isolated underwater facility , the film follows a team of scientists and their research on mako sharks to help fight Alzheimer’s disease. The situation plunges into chaos when multiple genetically engineered sharks go on a rampage and flood the facility. I enjoyed it a lot. Great entertainment kept me glued to my chair The Whole time, I love Samuel L Jackson and LL Cool J Both of whom were in this movie. I highly recommend. Jaws will always be the number one shark movie of all time, but deep blue sea is in the top 5 for sure. If you enjoy the shark movies like I do, then this is one you will enjoy! Great actors, great special effects and amazing setting. Not predictable but full of surprises. Man vs nature. Man vs man. Man vs himself. Good time! In the process of ridding myself of all my VHS tapes I came across this movie. Frankly, I had forgotten about it. It is a real sleeper. I think that it didn't get enough attention when it was first released. L.L. Cool J does a fantastic job as the ex-alcoholic cook that is really, really good and Saffron Barrows, well what can I say. The underwater sequences are pretty good and the sharks are really scary. Sci-Fi or action adventure. I think it is both. I recommend getting this movie you won't be disappointed. Everyone likes jaws, but its a bit out of date, so thank god this shark horror came out. 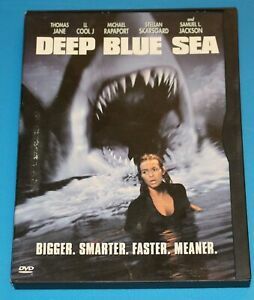 this one is much more terrifying and suspenseful than the older killer shark movies and has twice the plot (and what a weird one it is) scientists are on a secluded laboraty in the middle of the ocean genetically mutating sharks to make them larger so they can extract a cure for a disease. unfortunately making the sharks larger make them smarter and stronger too. These sharks systematically breakdown the compound and start eating everything they see. If you like gory shark attacks and suspense this is a movie you should see. It also has a plot unlike any other movie ever done which is very refreshing since we all know how hollywood has repeated so many ideas time after time. 2 thumbs up!! !